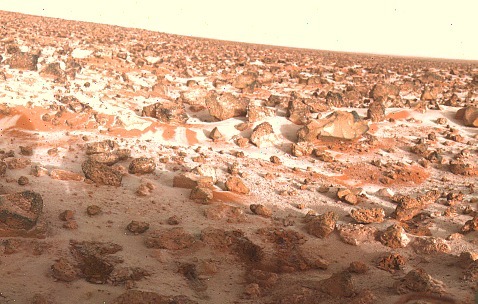 Finding life on Mars, while on the surface sounds good, is actually a fairly bad thing especially if it is separate branch from Earth life. Consider the Fermi paradox, if we find life on Mars that has evolved separately from Earth life it then says that the great filter for the development of life and the evolution of life are not rare events and thus those are no longer great filters. This increases the likelihood that the great filter or filters are ahead of us and decreases our chances of long term survival. I would think that just because we might find some microbes there, wouldn't necessarily mean it decreases our chances of survival, because, there is STILL that "what if" factor, for example, there might only be a handful of civilizations at our level or higher in the entire galaxy, for all we know, because maybe microbes are extremely common, but anything higher, multicellular life, is very, very rare, and even at that, intelligent life even more rare, we just don't know. And we won't know until we can plain-out tell whether a planet has life, from far away, and even what level it is on. Also, on the "separate branch than Earth life", I wouldn't be surprised if our probes haven't already seeded the planet, especially because of the earlier missions when we couldn't do as well on killing all living things on our spacecraft, plus the fact that there are quite a lot of microbes here that could possibly both survive the sanitation process for the spacecraft, the trip there, landing and environment of Mars, so if we do find Earth-type life there, it probably doesn't prove the theory that life originated on Mars and "migrated" to Earth. It could mean that, and it is perhaps the most disturbing possibility. But I think there are others as well. The filter might be between simple life and complex life, which kind of fits with the history of evolution of life on Earth. Simple life might be very common in the universe, but intelligent life and civilizations develop only rarely. Which is basically what Alek is saying. It could also be that there is no real great filter, and that the resolution to the Fermi paradox lies elsewhere. For example, we don't see other advanced civilizations because they aren't communicating with us. Maybe they don't want to or maybe they don't yet know we are here. Or maybe it is difficult for civilizations of different technological level to actually contact each other. Another possibility that disturbs me is if there is a great filter beyond the development of civilization, but it is interstellar travel proving to be unfeasible. Then it's an "all eggs in one basket" problem. Though there are pros to be found from that, too: at least the basket is safe from interstellar aggressors. Just to add to everything I would also like to propose that life has been so successful on Earth for couple of billion years that if we look hard enough we will find evidence of life on most bodies in our Solar System due to natural panspermia and that we are also sending objects out into our solar system and by no means is there any guarantee that the probes we send off are 100% clean Earth biology. I skimmed through the paper this morning and I got the impression that it really says that we think liquid water briefly flows at the surface, and if it does, it's toxic and it made the soil where ever it flows toxic. What's toxic to some life forms might be essential for others, but it seems more likely to me that this could rather explain why Mars, despite its water, appears to be totally without life. The evidence that does exist currently suggests that life is probably rare, complex life more so, and intelligent life even more. This is where the Fermi paradox comes in and where the idea of great filters come in. Everything to do with these sorts of calculations is statistics and probabilities and right now you have probabilities in the past and probabilities in the future for finding life and possibly predicting the future of our species. If you knock the probabilities in the past to likely( examples being: life developing, life evolving, multicellular life, Earth having just the right moon to balance the seasons, evolution of big brains, civilization), but the universe keeps showing us there are no signs of intelligent life, then the probabilities in the future for extinction become ever more likely and our chances for long term survival are drastically reduced. Space is hostile and the kinds of life on Earth capable of surviving space live in very specific niche environments and probably did not make the trip. Common bacteria most likely would not survive the long trip to Mars aboard a spacecraft. Add in the sterilization of the craft, the wild temperature fluctuations, ionizing radiation, months long journey without food, and exposure to vacuum then the likelihood of surviving the trip becomes so low that it is considered negligible. Simple life might be very common in the universe, but intelligent life and civilizations develop only rarely. Which is basically what Alek is saying. Which is all well and good but there is no evidence to support that view right now. This is a we won't know until we know sort of thing and the longer we go without finding any life seems to offer a better future for humanity than one where we do find simple life. If we find simple life but we continue to not find more complex life then perhaps complex life is the rarity, but given how fast life evolved on Earth and the number of planets in the galaxy alone it seems unlikely that this is a filter (especially if we find life on other worlds in our own solar system). My personal view is that planets like Earth are not very common, given the exact nature of our Moon and it's impact on stabilizing the climate, our distance from the sun, our planet having the right interior structure to support a strong long term magnetic field, life evolving, and eventually intelligence evolving alongside very specific climatic events. It all seems like a ton of improbable events occurred which is why we find ourselves here, perhaps all of these things or very slight variations on them are needed for a civilization like ours to become possible. If this is the case then it would be no surprise we aren't finding intelligent life. This idea seems silly once you start to go deeper into the thought process. There are already filters imposed on us by nature and so environmental filters always exist. A civilization evolving on a planet that has a larger gravitational pull than Earth, spaceflight would be extremely difficult at just 2x Earth's gravity, even greater gravity would drastically reduce the chances of spaceflight and possibly reduce the chances of intelligence evolving. A civilization evolving on a planet similar to Earth but with different material makeup, perhaps far fewer iron or metal deposits or no oil/coal/low natural gas reserves making it difficult if not impossible to industrialize. An intelligent species may evolve similar to dolphins, making spaceflight or advanced civilization highly unlikely. For example, we don't see other advanced civilizations because they aren't communicating with us. Even if they develop completely differently to us they would still require energy and so there should still be a way to find them from their energy production. In fact many recent suggestions for finding life are related to this idea. This one seems to be the most unlikely. We can build robots today that can survive long journeys, we know rogue planets can travel between stars, and we can see our technology improving and have models that suggest sublight interstellar vehicles are possible. Even if it is unlikely a civilization would invest the resources into doing this it still seems unlikely that no one would do it. Finding Earth life off world isn't really a point of concern given the history and diversity of Earth life. Ah, Peter Ward and Donald Brownlee, those two University of Washington scientists who came up with the Rare Earth hypothesis. First, they wipe out the aliens by saying that planets like Earth and complex life are rare, then they ended our world with what is basically our planet's life expectancy and how that our planet's eventual death by red giant would be equal to one's body breaking down before finally dying. So, you're saying that if there are no aliens, then humans are ultimately doomed since there'd by no way for use to leave Earth behind once the planet becomes uninhabitable. I think there's a major misreading here. 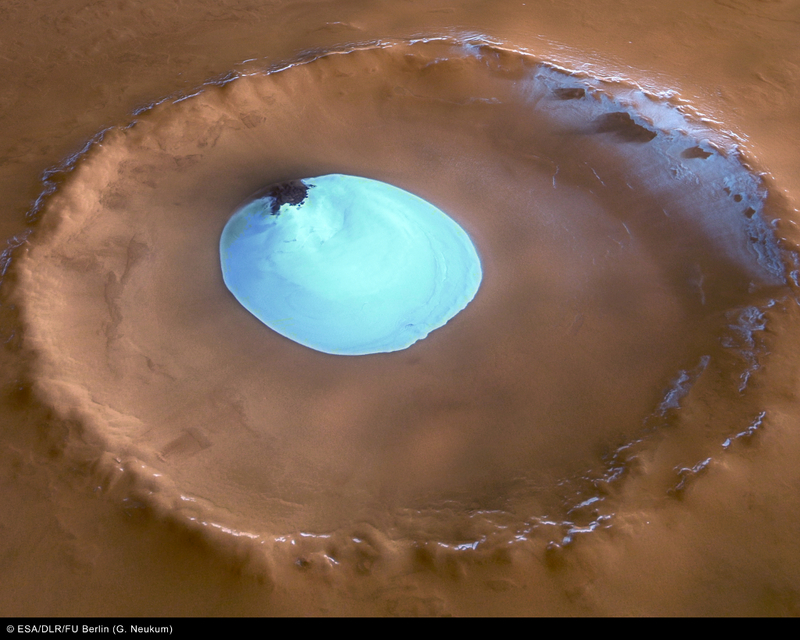 I've multiple pictures of Mars with water, and while a lot of them look similar a lot of them also look a bit different. Which ones are the most accurate? 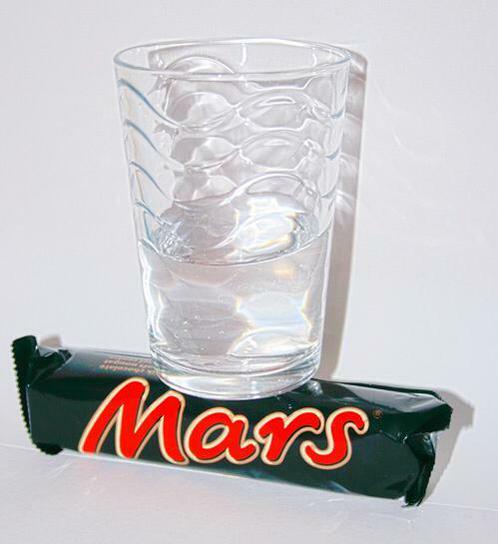 Most of the water on Mars is solid, found on or below the surface. 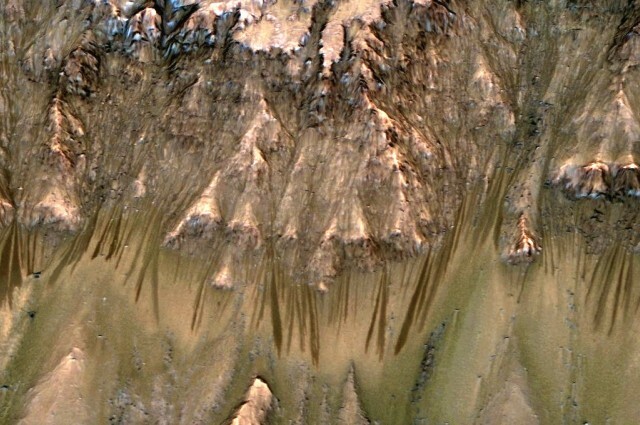 There is some liquid water, but it is a briny sub-surface flow, which appears as dark streaks that run down slopes (think of pouring water onto a sandy slope, where it flows down and through the sand, but darkens the surface where it is wetted). We can infer that these streaks are are related to liquid water by their seasonal appearance, and by their spectra (specifically the detection of water-based salts). Mars will probably have rings sooner than expected! I just hope there are no living beings on Phobos, it would be a nightmare looking at your own planet falling apart. In response to the idea that there may be no "Great Filter"…. True but those environemental filters will vary from planet to planet and none of them are show stoppers. After all, we're here and there is nothing that special about our planet. Untrue. It would just require them to launch rockets with engines with a higher ISP (specific impulse). Chemical rockets as we currently know them would be out but other propulsion technologies including nuclear propulsion, beamed propulsion would not. Those are technologies we have or have had in some form. We don't use them to get into space because we don't need to. Chemical rockets are easier for us but that doesn't mean that's the only way to get into space. It's hard to see how any planet with enough of a biosphere to support intelligent life would not have its equivalent of dead dinosaurs. As for iron and other metals they are ubiquitous enough than any planet which is similar to Earth will have them. Quite possible but as you say we don't know yet. I propose that the jury is still out on whether there is actually much of a paradox to begin with. We've only recently had the types of instruments sensitive to the search for intelligent life and are just getting ready to launch instruments capable of finding unintelligent life. In other words, it's early days but given the amount of habitable environments that likely exist in our galaxy (billions) we should find out in less than 20 or 30 years how ubiquitous life and perhaps even intelligent life is. those environemental filters will vary from planet to planet and none of them are show stoppers. A large asteroid or planetoid slamming into a planet would be a "show stopper". I am sure the dinosaurs would agree with you that none of those limiting factors are "show stoppers". Why not ask the ancient civilizations of Easter island how things are going since they used up all their resources? Sure there are remnants of them still around but the overall civilization declined due to overuse of resources. After all, we're here and there is nothing that special about our planet. Can you back that up? Do you have the evidence to make a claim that there is "nothing special" about our planet? The evidence so far seems to show we live on a fairly fortunate world with just the right conditions to allow our kind of life to happen. Higher energy demands would mean it would require a much more advanced civilization to do such things and with such high demands a civilization might abandon such notions. Look at our civilization as an example, it is exceptionally expensive to get things into space and we only have 1g to go up against. Larger energy requirements would mean a larger infrastructure requirement and a higher risk factor, these are simply limiting factors of physics. Lets also not forget that with larger energy demands the chances for even greater accidents increase as well, if you think a rocket explosion on Earth is bad just think of what could happen to a civilization with nuclear reactors in launch vehicles. It's hard to see how any planet with enough of a biosphere to support intelligent life would not have its equivalent of dead dinosaurs. What happened here on Earth is not a guarantee for what happens elsewhere. Venus is a planet of comparable size and is nothing like Earth. Earth has some very specific attributes that have been highly favorable to intelligent life so far. Why is everyone thinking that ALL life needs water? Alien life Will evolve differently on other worlds without water, nasa and some people are so human-centric. we know that life maybe could evolve different than life on earth. but we only know one kind of life and its the organic, water need life. Exactly. It is (somewhat) easy to search for something if you understand the thing you're searching for. It is very hard to search for something that you do not understand at all. No serious astrobiologist claims that water is requisite for all life in the universe, but with what we do know about chemistry and biology, water is by far the best substance to carry out the processes we believe are involved in the development of life. It's a matter of its remarkable capacity as a solvent and the temperature/pressure range for which it is liquid -- a range which also maximizes the Gibbs free energy. Plus, water is extremely common. So we expect most life in the universe to utilize it. Could there be life operating with other kinds of biochemistry? Maybe. But we don't understand what to look for if there are.